There is NO 2014 Airshow. Check back for 2015. The Sugarbush Airport in Warren, Vermont has been a home to Sugarbush Soaring and Jim Parker Airshows for over 35 years, providing the most brilliant and picturesque background for the stunts, aerobatics and graceful glider rides and lessons. Sugarbush Soaring offers glider rides and instruction for everyone. Start with a ride and work your way up to becoming a glider pilot. It's an affordable way to fly and is the best way to see the Mad River Valley. Jim Parker, performer, owner and airshow production director, has been thrilling audiences all over the world with daring maneuvers that seem to defy the laws of physics. We hope you enjoy exploring our love of aviation and adventure. We welcome comments, questions and visits to the airport, so we may share stories and the airport with you. 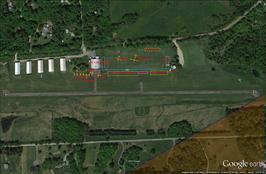 Please visit the Sugarbush Soaring website for details on glider rides and lessons.